Quilting Adventures: Friken fraken $()%*)#(*#($*%#*( ........! For the past couple of months, I have been unable to locate my favourite thimble. You know, the thimble I've had since I begin quilting, made of gold and silver. My special one! If that wasn't enough, pieces from my thread attachment are still missing. Seam rippers have disappeared..... Yes, it's been a nightmare in my home and now...... I cannot seem to find the yardage I washed for the Women of Influence BOM! If anyone knows where my special thimble is or anything else, please let me know! On the quilting front, I have completed a wall hanging. 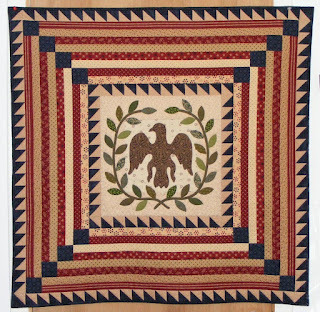 This is Liberty Eagle, a pattern from Jo Morton. The Shoppe received the Bonnie Blue America line by Marcus Brothers and I just had to make this quilt! Aside from pulling my hair and cleaning my sewing room in the hopes of finding my things, not much has been going on! The weather in September has just been gorgeous, which is nice given that we really didn't have a summer. The leaves have started to turn their autumn shades! It's beautiful! Thanks for stopping by! Don't forget to let me know if you find my thimble and other things! Cheers! I can't help you with your thimble but I love the wall hanging! I will never get the hang of a thimble or anything else on my fingers;) I do love that quilt and the fabrics, beautiful piece. Carole, the quilt is gorgeous! I will let you know if the things you miss will turn up in December when the Yulelads come to town :) The quilt is beautiful and so well done, the pattern in the fabric is so straight! Hey, maybe your thimble has run off with my table runner! It's been missing for 2 1/2 years -- it's not exactly something so small that it would run off by itself??? If you find them, let me know. LOVE that pretty quilt! Love, Love, Love the quilt! Beautiful job! Love the quilt. You call the sprites, I call them grandchildren. My grands seem to think if the most fun to gather up items in my sewing room and scatter them throughout the house. Wow that is a beautiful quilt! Hope your supplies turn up! Just wanted to drop you a line saying that my girlfriend and I really enjoyed our two stops at your shop yesterday. Everything looks wonderful and we'll definitely be back. Love your fabric collections and your Liberty Eagle wall hanging is beautiful. I blogged about your shop today. Stop by and have a look. I'll have to have a look behind my dresser. Occasionally, I watch things of mine roll off the back of it, whereupon they disappear and are never seen again. But I find things back there no one in our has has ever seen before. Dinky cars, brown lipstick, a single knitting needle, a mustache comb. I'll see if your thimble is back there! I will look for your missing items...looks like the sprites live at both our houses! LOL! so is the shop selling a kit for this quilt? Your quilt is beautiful! I love the various reds in the stripes. I am interested in opening my own quilt shop. I have a Masters degree in Nursing, but it's not as much fun as quilting. Any suggestions on how to get started? I LOVE that sample you made. It's the cutest. Great job. I'm sorry you've lost your stuff. Hope it turns up soon. Are you ready....?!?! I've been busy....!